The Paleozoic is bracketed by two of the most important events in the history of animal life. At its beginning, multicelled animals underwent a dramatic "explosion" in diversity, and almost all living animal phyla appeared within a few millions of years. At the other end of the Paleozoic, the largest mass extinction in history wiped out approximately 90% of all marine animal species. The causes of both these events are still not fully understood and the subject of much research and controversy. 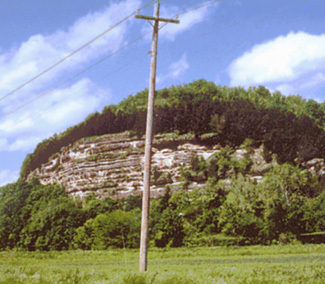 Roughly halfway in between, animals, fungi, and plants colonized the land, the insects took to the air, and the limestone shown in the photo at right was deposited near Burlington, Missouri. The Paleozoic took up over half  approximately 300 million years (542 mya to 251 mya)*  of the Phanerozoic. During the Paleozoic there were six major continental land masses; each of these consisted of different parts of the modern continents. For instance, at the beginning of the Paleozoic, today's western coast of North America ran east-west along the equator, while Africa was at the South Pole. These Paleozoic continents experienced tremendous mountain building along their margins, and numerous incursions and retreats of shallow seas across their interiors. Large limestone outcrops, like the one pictured here, are evidence of these periodic incursions of continental seas. The Paleozoic Era is bracketed by the times of global super-continents. The era opened with the breakup of the world-continent Pannotia and closed with the formation of Pangea, as the Earth's continents came together once again. Many Paleozoic rocks are economically important. For example, much of the limestone quarried for building and industrial purposes, as well as the coal deposits of western Europe and the eastern United States, were formed during the Paleozoic. The Paleozoic is divided into six periods: the Cambrian, Ordovician, Silurian, Devonian, Carboniferous (in the U.S., this is divided into the Mississippian and Pennsylvanian Periods), and Permian. Most of these names derive from locations where rocks of these ages were first studied. Cambria was the Latin name for Wales, and the Ordovices and Silures were two Welsh Celtic tribes. The Devonian is named for Devonshire, England. The Mississippian is named for the upper Mississippi River valley, not the state of Mississippi, which has very few rocks of this age; however, the Pennsylvanian is named for the state of Pennsylvania. The Permian was described from rocks in the region of Perm, a town in the Ural Mountains of Russia. The exception to this naming convention is the Carboniferous; its name means "coal-bearing," and this is a time when extensive coal beds were formed around the world. Two great animal faunas dominated the seas during the Paleozoic. The "Cambrian fauna" typified the Cambrian oceans; although members of most phyla were present during the Cambrian, the seas were dominated by trilobites, inarticulate brachiopods, monoplacophoran molluscs, hyolithids, "small shelly fossils" of uncertain systematic position, and archaeocyathids. Although all of these except the archaeocyathids survived past the Cambrian, their diversity declined after the Ordovician. Later Paleozoic seas were dominated by crinoid and blastoid echinoderms, articulate brachiopods, graptolites, and tabulate and rugose corals. By the end of the Ordovician, life was no longer confined to the seas. Plants had begun to colonize the land, closely followed in the Silurian by invertebrates, and in the Upper Devonian by vertebrates. The early tetrapods of this time were amphibian-like animals that eventually gave rise to the reptiles and synapsids by the end of the Paleozoic. One of the earliest terrestrial tetrapod faunas known in the world is from Joggins, Nova Scotia. Land plants evolved rapidly into the vacant niches afforded them on land. By the end of the Devonian, forests of progymnosperms, such as Archaeopteris dominated the landscape. By the end of the Paleozoic, cycads, glossopterids, primitive conifers, and ferns were spreading across the landscape. The Permian extinction, 251.4 million years ago, devastated the marine biota: tabulate and rugose corals, blastoid echinoderms, graptolites, the trilobites, and most crinoids died out. One lineage of crinoids survived, but never again would they dominate the marine environment. Aldan River, Siberia: Lower Cambrian fauna from this site in Yakutia, Siberia, trace the early evolution of animals with skeletons. Burgess Shale: One of the greatest fossil finds ever made is the Burgess fauna of British Columbia. Thousands of soft-bodied animal fossils paint us a picture of Cambrian marine life. Canning Basin, Australia: A great diversity of fossil gastropods has been uncovered in the Canning Basin. Glass Mountains, Texas: Permian fossils from the Glass Mountains are of shallow, warm-water marine life. House Range, Utah: A varied array of Cambrian critters has been found in the Wheeler Shale and the Marjum Formation, both of which are exposed in the House Range. Joggins, Nova Scotia: Carboniferous coal swamps were home to early tetrapods such as Dendrerpeton. Lake Winnipeg, Manitoba, Canada: The limestones of this region have preserved many spectactular fossils of Ordovician macroalgae. Marble Mountains, California: Olenellid trilobites are plentiful in the Latham Shale, here in the Mojave Desert. Mazon Creek, Illinois: This site has become famous for its iron concretions preserving both plants and marine invertebrates. Rhynie Chert, Scotland: This has been one of the most important sources of fossils of early land plants and terrestrial arthropods. The anatomy of specimens is preserved in three-dimensional detail. White-Inyo Mountains, California: You can visit Cambrian reefs in the mountains of eastern California. Find out more about the Mesozoic paleontology and geology of North America at the Paleontology Portal's pages on the Cambrian, Ordovician, Silurian, Devonian, Carboniferous, and Permian Periods. See the Wikipedia page on the Paleozoic. Read more about the Permian-Triassic extinction on Wikipedia. Find out more about the complex history of the formation and break-up of Pangea on Wikipedia. * Dates from the International Commission on Stratigraphy's International Stratigraphic Chart, 2008.